Whether its for a Kitchen, Bathroom, Conservatory or any room in the home, there is a vinyl floor which will complement your decor. From realistic wood effects, tile & marbles designs. Being easy to clean & water resistant vinyl flooring can bring fresh idea's to the home. 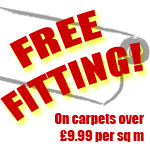 There are 3 widths available for greater economy - 2, 3, or 4 metres, with prices starting from just £6.50 per sq m.